In little under a week the Doors of Hell will once again open to release Milan Design Week on our unsympathetic, unapologetic world. The normally pleasant, quiet and reasonably priced Lombardian metropolis will be overrun by molten rivers of corporate greed and naive student hope, transforming the canals, parks and former industrial sites into burning pits of contradiction, imitation and pure gold. Survival is a question of ignoring reality and convincing yourself that everything is brilliant and that you are having a really, really good time. Technically, the same procedure as every year…..
….. only this year one of the saner heads in the madness will sadly be missing: Moormann ain’t going. Essentially the reason is dissatisfaction with the stand they were offered at the furniture fair and a general unhappiness with the way the whole process was/is organised and communicated. When we spoke to Nils Holger Moormann in 2011 he commented on the problems of the stand distribution in Milan. And in recent conversations with senior managers from other contemporary furniture producers we know how infuriating and drawn out the stand distribution system in Milan is. The majority however see no alternative and so endure what they must endure to ensure their presence. Presumably with 2013 the Moormann camel has finally had one straw too many placed, roughly, on its back. For us the bitter irony is that the vast majority of Hall 20 – which is where the contemporary manufacturers are housed – will be Italian producers who not only are presenting nothing even vaguely innovative, but whose “new” objects are not even destined to see production and are only on display to catch attention. Wasting space for show rather than using the opportunity to allow the industry to grow and develop. While we’ll obviously miss Moormann, we do find the resistance good. Milan’s monopoly needs to be broken, and while that will be a long process the more people who make the conscious decision not to go, and publicly justify it, the quicker we will have the alternatives the contemporary designer furniture industry so badly needs. The one, very, positive fact in Moormann’s decision is of course that when faced with a challenge, Moormann tend to respond in the most glorious, creative, off-beat fashion. The Bookinist Cup being one of the better examples. We know that Morrmann have new products. We know Moormann want to show them. We can’t wait to find out where and how that is. Naturally, what with Moormann being Moormann, they didn’t announce their Milan absence with a simple press release. No. 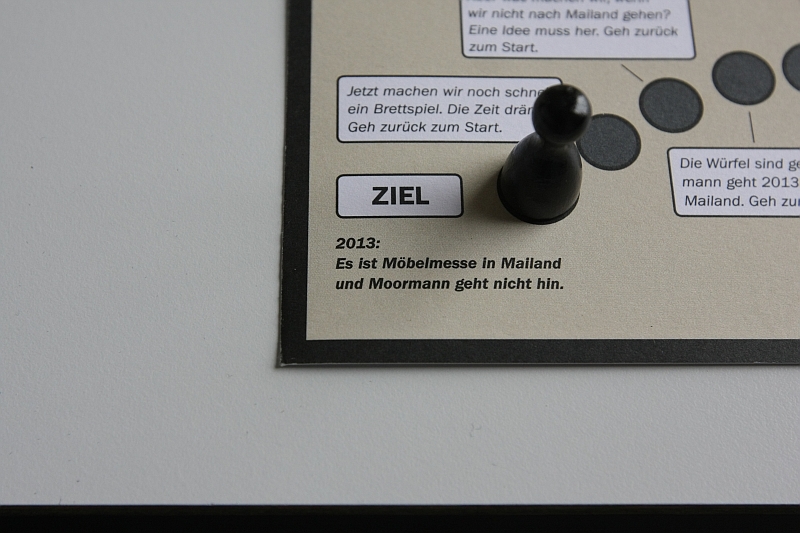 Moormann developed a board game. And we, having as ever far too much time on our hands, managed to play a quick round…. The Fall of the Vitra Fence.